Regularly, we receive questions whether bamboo can be kept in a container and which species is most suitable for this. In order to make this information available to all, we wrote this article with some basic principles. Also check out our article with a more complete view on the world of bamboo: Clumping & running bamboo: everything you need to know. There are many situations thinkable where you could only use container plants. Bamboo is a good choice for this kind of gardens. It gives an exotic look and is evergreen. Ideal as a natural separation for some privacy or to an ugly wall by example. A large container with enough depth is preferred. Not only will the plant be much more stable in windy conditions, this kind of container can held more soil and therefor will dry out much less quickly than when the bamboo is planted in a small pot or tray. Minimum sizes will be about 40 cm (1,4 ft) deep and 40 cm wide. The larger the container, the more autonomous the plant will be in terms of water needs. Also, the plant will do better when it gets the space it needs. Use a container with holes in the bottom so that no water will stay in the bottom to avoid rotting. In principle, each type of soil can be used, although rich soil will be preferable. 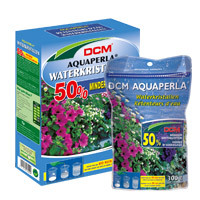 It can be wisely to mix in a few hands of water retaining crystals such as Aquaperla DCM®. These crystals absorb a large amount of water to subsequently release it again. Bamboo needs a lot of water! Summer and winter. 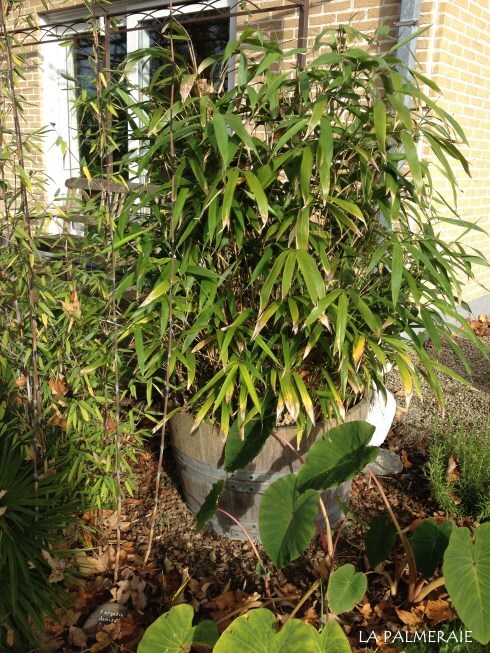 Especially on windy days, bamboo can evaporate lots of water, allowing the soil to dry out quickly. Fortunately, the plant also show its water needs: when leaves are starting to roll, the bamboo is thirsty. Better of course is the water before the leaves start to roll. Regular and generous watering is therefore advised. Of course they are not aquatic plants neither, so the soil should be moist but not wet. In principle any bamboo species can be used in a container, but not all of them will do as well. The most suitable species for containers remains the Fargesia rufa we think. This species is hardy, grows fairly broad and becomes 1.5 to 2 meters (3,5 – 6,6 ft) high in a container. If it has to be tighter then the Fargesia sp. jiuzhaigou 1 also may be considered although this species rolls its leaves faster. A Fargesia robusta is also an option. On the pictures in this article you’ll see a Pseudosasa japonica in a tub. This species has varying success and was replaced by a Phyllostachys nigra in the meantime. 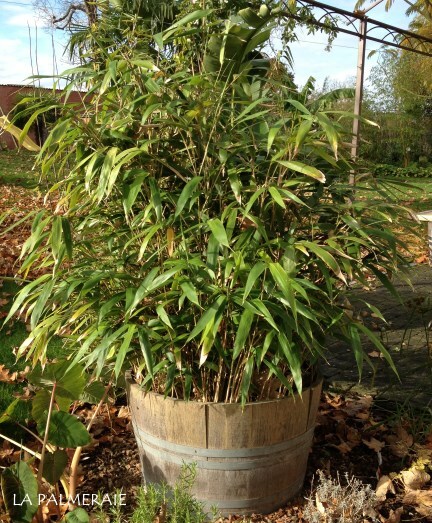 Besides the regular watering and adding some fertilizers during the growing season, the bamboo in a container does not actually require any particular maintenance. However, in spring, the bamboo can be tightened up by pruning the oldest (thinnest) canes just above the ground. If desired, the plant can be pruned at any time of the season and at any desired place. For example, to obtain a certain shape or maximum height. When the bamboo has become a full groove after many years, it may be taken out of the tub to divide into pieces and then be re-planted again.